MIchael B. Jordan plays Guy Montag, a man who burns books for a living, in Fahrenheit 451. Ray Bradbury’s classic work of dystopian fiction eerily predicted some of the reality we now live in, but it didn’t anticipate everything. 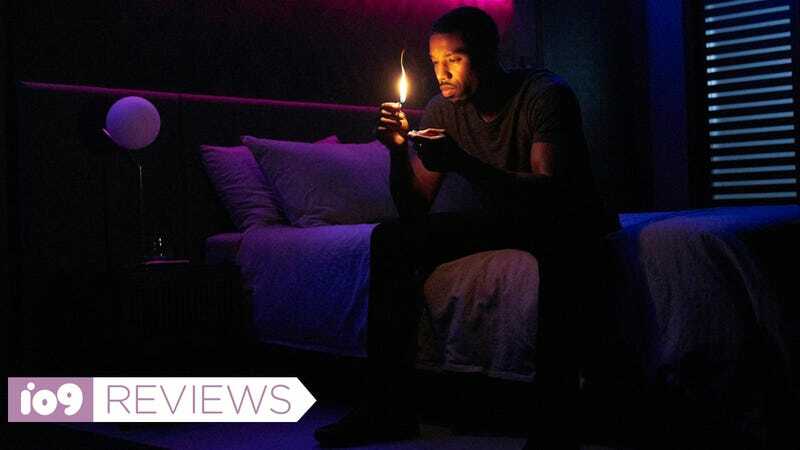 A new movie pulls Fahrenheit 451 into a new future extrapolated from where we are in 2018, while trying to hold on to the novel’s thematic pillars—a job it can’t quite handle completely. Aired for the first time last night on HBO, Fahrenheit 451 operates on the same premise as Bradbury’s novel. Guy Montag, played by Michael B. Jordan, is a “fireman,” a man who belongs to a corps of public servants that burn books. In the film adaptation directed by Ramin Bahrani, firemen get re-imagined as celebrity media censors; early on, there’s a creepy sequence where schoolchildren recoil at the sight of books and cheer them being burned. That school visit and most of the firemen’s public activities are broadcast on the Dark Nine, the tightly controlled digital network that’s replaced today’s relatively free and open internet. The hunts for non-compliant citizens called “eels” are social-media bloodsport, culminating in arrests, identity deletion, and book-burning that combine into prime-time entertainment. 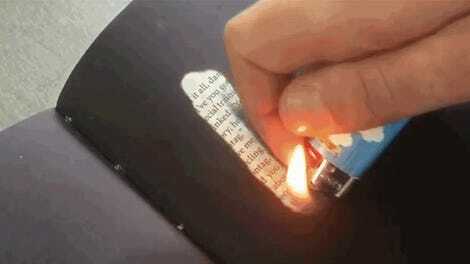 Firemen don’t just destroy books, either. Music, movies, and any other cultural production that could lead to independent thought are all destroyed. In the movie, Montag isn’t married as he is in the book. Instead, his emotional depth gets tethered to hazy memories of his father, who was a fireman before him. Montag’s being groomed to succeed John Beatty (Michael Shannon) but his path to ascendancy becomes less clear after he starts reading the books he’s supposed to burn. Jordan’s portrayal of Montag moves between two poles. At first, he bursts with the zeal of a gung-ho sports celebrity, cocky and confident about his place in society. But, once doubt sets in and he learns how history has been re-written, he’s tentative and emotionally fragile. Played with flinty resolve by Shannon, Beatty struggles with his own temptations, too. We see him writing down quotes from books he’s read and/or destroyed but burning them to avoid being tempted by their power. The desire to know oneself through the written word, even when forbidden, comes across as an irresistible aspect of human nature, which is an important goal for a project like this to achieve. But there’s a lot of obstruction that blocks that path, whether it’s the mandates of the Ministry regime or the noise of state-influenced social media. This Fahernheit 451 movie touches on and modernizes many of the world-building elements of the novel. We see firemen medicating themselves with mind-altering eye-drops (which are pills in the book) that keep them in line with society’s group-think, and the “parlor walls” of Bradbury’s novel—huge television-like surfaces that receive numbing, state-sanctioned entertainment—have been scaled up. They’re not just load-bearing elements of a house; they’re the entire sides of skyscrapers, too, beaming propaganda at all times to the populace at large. All of this is abetted by Yuxie personal assistant devices, which are clearly modeled on the Siris, Cortanas, and Alexas of our day. I liked the aesthetic interpretations of this new Fahrenheit but the focus on commenting on today’s social media landscape and changes to plot and narrative rob the story of some of its ruminative appeal. The overall feel of Bahrani’s adaptation is much more melodramatic than the novel. The focus is in so tight on Montag, Beatty, and black-market informant/smuggler Clarice (Sofia Boutella) that we don’t get a sense of global scope. We’re told of the far-reaching implications but they don’t resonate in the same way. Most of the third act gets significant changes that diverge widely from the book. There’s still a germ of hope that the flow of free thought may survive, but it happens in a mechanically different way. But for all its conflicted nature, this version of Fahrenheit 451 still manages to convincingly communicate the undiluted power of writing that comes from free thought.